Limited edition : 300 pieces. 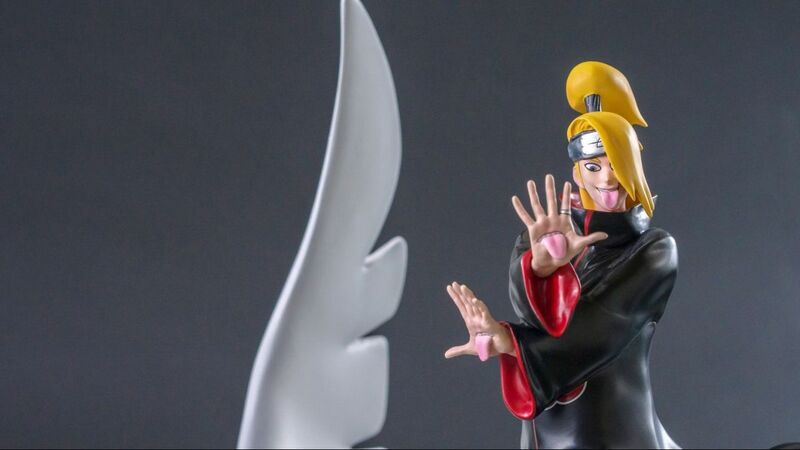 Deidara is the second character from Naruto Shippuden and the very first one from Akatsuki to be a part of our HQS collection. Statue Art of bang, High quality Packaging with serial number, limited serial metal plate. Member of the terrorist group named Akatsuki, Deidara has teamed up with Sasori for the raid over the hidden village of Sand. They intended to kidnap no less than the kazekage, Gaara! 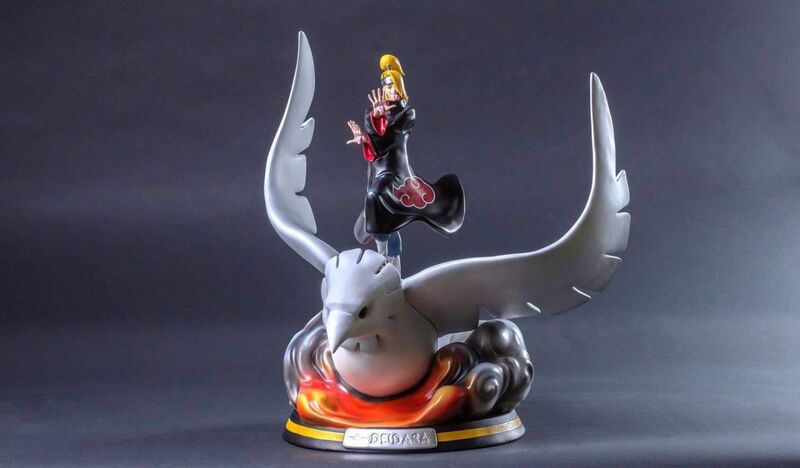 Deidara's techniques combine bakuton (art of explosion) and a supernatural skill of clay molding : the Kibaku Nendo. With his two extra mouths in his hand, he mixes clay and his chakra to mold it into an animal which will be sent towards its target to explode. 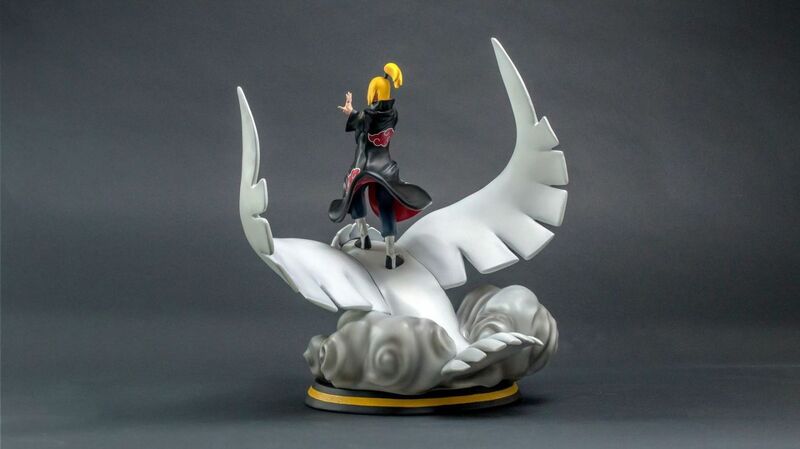 To get in the village silently, Deidara molded a clay bird who grew enough for Deidara to stand on it. Deidara is standing still, arms crossed ahead with an arrogant and dismissive demeanor... He considers himself as an "artist" and despises anyone who does not understand his art. As he is quite whimsical, you can see in the attitude of the three mouths of him his lust for driving the others to extremes. Of course, he wears his akatsuki coat and his bang hides almost totally his left eye and his eyepiece. 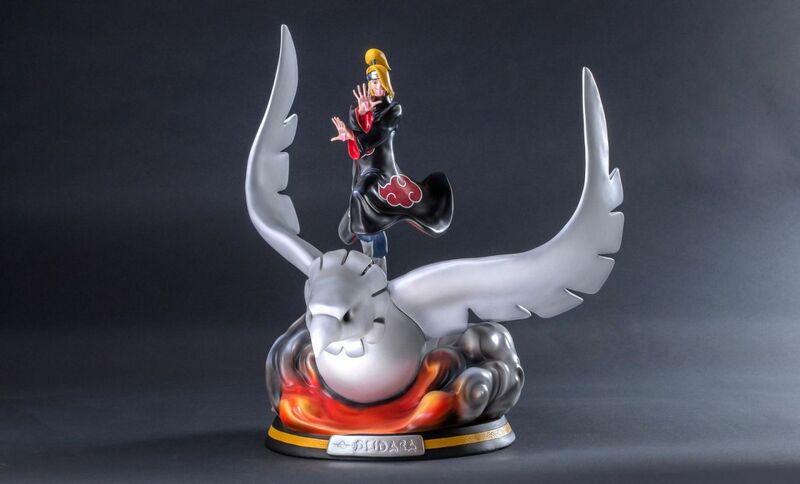 The statue of Deidara himself is very detailed. Each hand is perfectly sculpted with its extra mouth from which spurt out a tongue as a deadly threat to its opponent. His look angled down expresses exactly his despise for anybody and his superiority feeling. Lastly, blown by the explosion, his Akatsuki patterned coat is seething under the wind, bringing some dynamism to Deidara's pose. Facing Gaara and his sand hand, Deidara is flying on his giant clay bird, he made himself with his personal techniques. 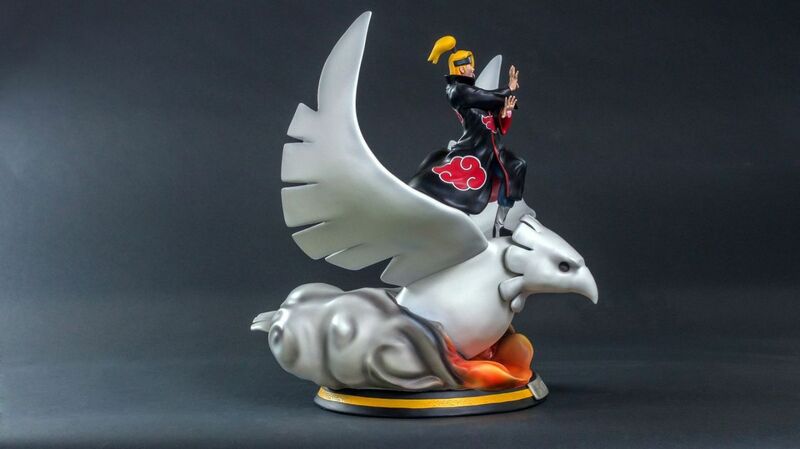 His impressive mount is raising in the air due the explosions Deidara makes. That's why the bird is lying on a dust and fire cloud, which create a fascinating sheaf of color. The clay bird is displayed with his wing spread out. Its texture and painting have been greatly worked on to get this fine mate and delicate result... It's lying on a dust cloud mixed his the fire of an explosion where we also succeeded in getting a great game of textures and colors. The vivd colors are emphasized by the varnish whilst the mate rendering of dust and sand are balancing this whole. The base is very much alike Gaara's one, colored with a mate black and a color lining going through the middle of its circumference. However, this lining is not red this time, we felt like yellow would be a fine reference to Deidara's hair color. Lastly, a metal effect plate is engraved with Deidara's name with a font like the logo of the anime and manga. Obviously, the most impressive part of this statue is its unusual size which makes it a true work-of-art: with 45cm high, this HQS has been thoroughly engineered so we could achieve a weight reasonable and be sure you could display it on your furniture.